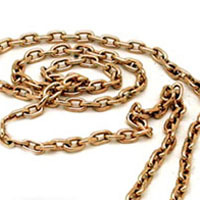 Here is our trademark hand made chain in 14K yellow or white gold at a standard length of 24". These fine chains are created from coils of 16 gauge wire and each link is formed and soldered individually, and the clasp is completely handmade. There is nothing machine made in this piece. The standard length totals out at 24" long. Perfect for a large gold pendant over a tuxedo, or even simply under your shirt, the best average length. If you would like longer, or shorter, please select from the list below or contact us directly. 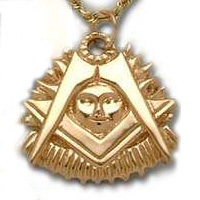 The chain does not include a pendant, that will have to be ordered separately or arrangements made directly with us. 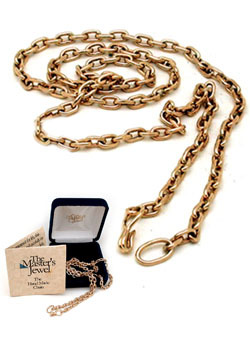 Each chain is packaged in a genuine velvet gift box and with printed descriptive materials and a lifetime warranty. It is a very special piece of hand made jewelry with a feeling like no other. I finally had the opportunity to have Bro. Drew create chain for myself. To say I'm blown away is an understatement. This piece is incredible and will be handed down to my son.